Some people are naturally gifted, some people are good at things with practice and some people have to work damn hard to achieve their goals. Regardless of any of the above, self belief is the key to success. Without self belief we struggle to reach our full potential. Our motto here at Crabtree Fitness is “there is no can’t”. We continually reinforce this to our clients when they are struggling. We tell them “YOU CAN” and nine times out of ten it gives them the self belief to continue and achieve. But, over the last few weeks I’ve been having a battle with my own self belief. Having already achieved the ultimate running experience of the marathon and tackling the mud, electric shocks and fire of the “Tough Mudder” experience, I needed to find something else hard. I like hard. So signing up for a triathlon was the next ultimate experience, especially because I wasn’t a very good swimmer, in fact I was a really crap swimmer. 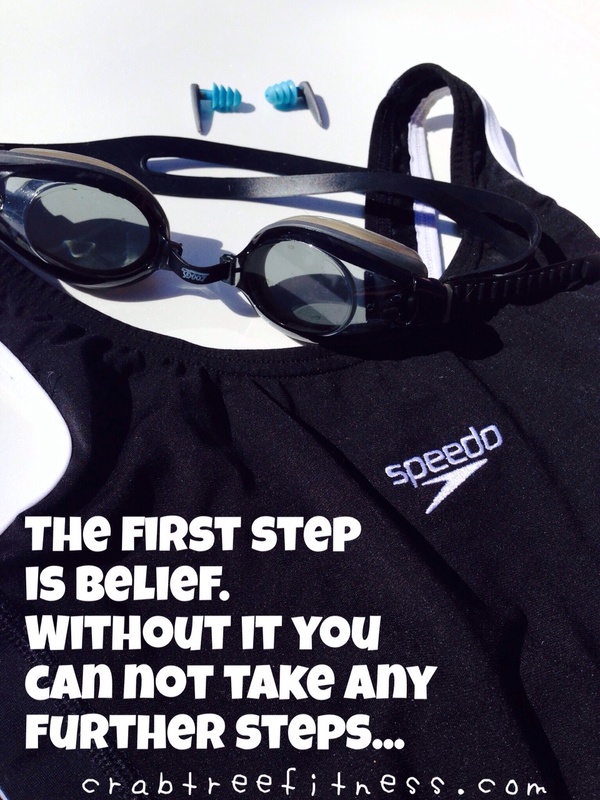 My self doubt crept in as I struggled to excel in the swimming pool. It was never a mental issue for the ride or run leg of this triathlon, it was the swim leg that was dragging my confidence down. “How can I not be good at this?” ” what if there are sharks or worse still seaweed in the water?” ” I can’t even swim 25 metres without stopping let alone 800 metres”. I felt like quitting! But I’m not a quitter. Something was missing, SELF BELIEF! As a personal trainer it’s my job to motivate and encourage people, I just needed to motivate myself and have faith by telling myself YOU CAN. So on Friday I jumped in the pool for my training session with a sense of empowerment and my sense of self belief and you know what? I did it!! I could swim, I swam a whole kilometre!! My breathing and technique finally fell into place. With this, I ask you all to have a sense of self belief. Whether it be during a tough training session, or keeping on track with your nutrition, or even making that commitment to the discipline required to meet the goals you have set for yourself. We do ask you one thing this week, bring along your self belief for Mondays workout, it’s gonna be tough, think bricks and hills, people!!! THERE IS NO CAN’T. Healthy Cheese……do you have a cheese fetish? This one is for you. http://www.taste.com.au/recipes/7011/labne+marinated+yoghurt+cheese+balls. Anyone needing help with their food diary can pass it on to us for some healthy advice. Hopefully it’s keeping some of you accountable to make healthy choices. Lastly, the Monday Mums Bootcamp that is on at 2.15pm will be changing to a 9am session from next week . It will still be 2.15pm tomorrow (mon 24th Feb).